Writing from the heart occurs in two distinct phases: spew, and then clean it up. In the first phase, the goal is to capture feelings. The heart does the writing while the mind sits quietly waiting its turn in the second phase. The hard part is keeping the mind quiet while you spew. It wants to correct your spelling. It wants to change the verb to something better. It wants to break up that long sentence into something more punchy. And if you give in and make those changes, the heart forgets what it was feeling. It stops feeling. When you want to get the feelings down, you want to keep the brain out. I’ve learned a couple of tricks that help. It will interrupt a couple of times but if you successfully turn away and don’t do what it suggests, eventually the mind will sulk away and leave the heart alone to spew. Don’t let the brain read what the heart is writing. Bad method: You can do this by turning the brightness all the way down if you have a knob or keys to do that but don’t use the mouse because if you turn it all the way off and then accidentally nudge the mouse, you won’t be able to see where to grab the control on the display to turn it back up again. Better method: Put a plain sheet of paper in front of the display using a piece of tape to hold it in place. Don’t look at the display. If the brain can’t see what you’re writing, it will be less likely to intrude. And even when it does, it’ll be easier to ignore because the brain’s attention span is rarely more than the last word or two. Keeping the brain quiet is best. For this, keeping the brain from reading what I’m writing works best. The paper over the display works but at the coffee shop, it attracts attention. Someone is bound to ask, “Why do you have the display covered up?” That will break my concentration. And even if no one actually asks the question, you’ll know — your brain will know — that the person standing behind you is looking at your computer and wondering. Looking out the window instead of at the computer is a little better — no one is likely to interrupt the heart’s reverie — but then the mind, looking through your eyes, is liable to distraction from what you then see. Closing your eyes works extremely well. At least until you lose the train of thought. But when that happens, you need to open your eyes long enough to re-read the last few words. And if your brain then sees “everything”, it quickly jumps in and starts pointing out all the things that need to be fixed. It can be next to hopeless to re-capture the feeling the heart was trying to say. For me, the “best” solution is one of these. It’s an Alpha Smart 3000. It runs on three AA batteries, records your keystrokes and lets you see — if you look — only a couple lines of text, short ones at that. And a used one on eBay.com will run you $20-30. Transferring the typing from the Alpha Smart to your PC is done via a USB cable but there’s no hurry — I’ve typed stuff I didn’t upload for months and, in a couple of cases, more than a year. The Alpha didn’t lose a thing during all that time. This is what I use at my local coffee and bagel shop where I do a lot of my “blue sky” writing. 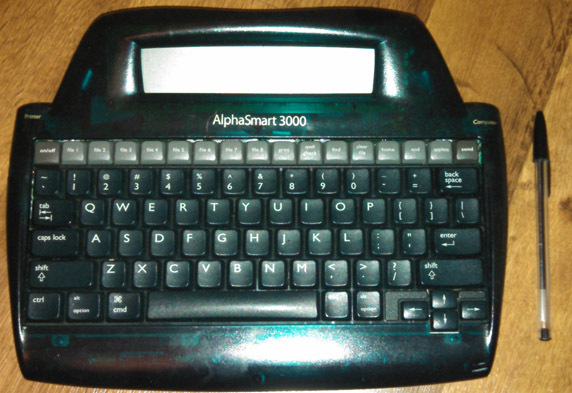 As you can see from the picture, the Alpha Smart 3000 is the width of a keyboard without the number pad, and only a little bit taller. I set it on the table, put my coffee to the right and everything bagel, toasted with a “shmear”, to the left, push the power button and I’m ready to go. No power cord. No boot up. It’s ready and will hold hours of spew. I have a small case with a handle, strictly for convenience, that also holds a spare set of three AAA batteries and the USB cable that’s used (later) when uploading to my main computer. After that first hot flush of writing, I return home and transfer what I’ve typed into my main PC to be edited. For this upload, I connect the Alpha Smart to my main computer via a USB cable. Once connected, the PC thinks it’s just a keyboard so I start my word processing program, start a File -> New document, click in column one and, on the Alpha Smart, push Send. Everything spewed into the Alpha Smart is then dumped into the PC as if you were typing it fresh, albeit very quickly. When the transfer is done, do a “File -> Save As”, type the filename (using the Alpha Smart — the PC thinks it’s a keyboard, remember?) and then click “Ok” to save the work. You can then erase what’s in the Alpha Smart. Then, it’s time for that second phase of writing, the clean up. This is the time-consuming part and you’ll want all your PC editing tools to help you out. Spell checking suggestions, auto-correction, sentence and punctuation help and so forth are the domain of brain and it’s time to let him work. Spew then edit. Heart then brain, but never both at the same time. When you need to capture those raw feelings from the heart, most of the Alpha Smart models — avoid the very first model because it works only with ancient Macs which few of us have now, get one of the USB models like the 2000 or 3000 — are ideal. Yes, it’s old school by today’s standards. It looks dorky and, because of that, most people will leave you (the weirdo) alone. You can spew without interruption on your strange little Alpha Smart. My recent “Why Camp Perry” article on this blog had its heart captured on my 3000 at my neighborhood Einstein’s Bagels. After I had the feelings captured, I then let my brain clean up the writing at home on my Mac. Spew first, edit later. The trick is keeping the brain out. Just like when shooting bullseye.